Here is an update on some of the changes I'm working on to Ironfist. In the video you can see that support has been added for cd music via .mp3 (or .ogg) files in the ironfist/tracks directory. This is the same type of setup that h2cdplay uses (the code is actually from there), but I also added the ability to switch between the SW/PoL town screen tracks. If the audio is set to 'CD Stereo' it will use the audio that matches the midi, if it is set to 'CD Stereo With Opera' then it uses the opera tracks that are played in H2 Gold (and I guess regular PoL too). The audio is very quiet on youtube, I don't know why the capture volume was so low, but it is only a problem with my screen recorder, the volume is fine in the actual game. I am also working on converting things to widescreen, but that is still underway. If anyone has knowledge of how Win32 DIBs and paletting work, I could use your help. In the original Heroes 2 program (ver 1.3), when the sound is set to Midi, the music play instantly when the player switches between the castles in the town screen. In the Gold version (ver 2.1), when the sound is also set to Midi, there is a delay of 1 to 3 seconds before the music start to play when the player switches between the castles, it's very annoying, sometimes you switch between the castles with no music at all (due to the delay). In your video, it seems that the music play almost instantly when you switches between the castles, this is very nice. Also, the possibility to choose between the SW and PoL musics is really great, I personally prefer the SW musics, so all good. The widescreen mod is promising and not "overdone" the way you make it, continue this way. I can only help you with some encouragement. Looks promising Keep it up! Yes, more info with right click, I like it. And this time, I can help you. I made a list for this, feel free to use it. On the adventure map, right click on interactive sites (where the hero can move) shows information (ex: Witch Doctor's Hut (not visited), Fort (already visited), etc.). Add information for all types of sites. *** Ex. with Witch Doctor's Hut. *** Ex. with Witch's Hut. *** Ex. with Tree of Knowledge. *** Ex. with Trading Post. The hero need to be level 10 to enter Xanadu. Each level of Diplomacy count as a level. A level 7 hero with Expert Diplomacy can enter Xanadu (7+3 = 10). The Statesman's Quill Artefact should also count. Statesman's Quill tweaks 02: The Statesman's Quill also count as a level to enter Xanadu. So with Expert Diplomacy and Statesman's Quill, a level 6 hero can enter Xanadu (6+3+1 = 10). *** Ex. with Freeman's Foundry. One hero player has already visited the site (another friendly hero win the combat, or the site was already visited by an opponent hero and the friendly hero took a morale penalty). *** Ex. with City of the Dead. Right click on interactive sites with possible recruitments, shows information. (last visitor): one hero of the player has fought, he has won the combat or not. No enemy heroes has moved on the interactive square (it does not need the enemy hero entered the site, it may just have moved on the interactive square without entering the site). (you can recruit): one hero of the player has fought and has won the combat. You can now recruit creatures. (8 units): 8 units are available to buy. One hero of the player has fought and has won the combat 3 weeks earlier (2 creatures just after the combat + 2 creatures each week). Number of available creatures is also displayed with free creatures generators on the map (ex: Archer's House) if at least one friendly hero is the last visitor ((you can recruit) (20 units)). Suggestion here concerning the interactive sites with combats (Pyramid, Graveyard, City of the Dead, etc.). If a hero has eliminated some of the créatures and then fled, the next time, he will fight only the remaining number of créatures (friendly or opponent heroes are taken into account). Right click on the combat site shows the remaining number of creatures (only if no enemy heroes has moved on the interactive square (it does not need the enemy hero entered the site, it may just have moved on the interactive square without entering the site)). So a friendly hero has fought 100 mutant zombies in a graveyard. He has eliminated 60 of them and has fled. Right click on the graveyard shows (guarded by 40 mutant zombies). Next time a hero will enter the graveyard (friendly or opponent hero), he will fight only 40 mutant zombies. If a enemy heroes has moved on the interactive square even without entering the graveyard, right click shows (you tried) (not the last visitor). Day 3, a friendly hero has fought 100 mutant zombies in a graveyard. He has eliminated 60 of them and has fled. There is now 40 mutant zombies to guard the graveyard, but only until the end of the week (day 7). Next week (day 1), the guardian creatures are resupplied (100 mutant zombies to guard the graveyard). *** Ex. with wandering creatures. 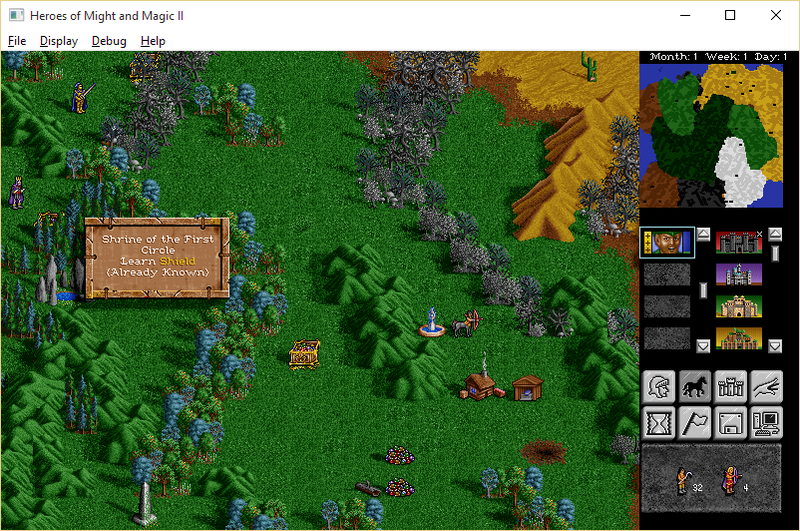 Right click on a square with wandering creatures (and adjacent squares) shows information. (actual Diplomacy level: 1): informs the player that selected hero has the diplomacy secondary skill at basic level (creatures will sometimes offer to join the hero army). (Hideous Mask): informs the player that selected hero has the Hideous Mask (prevents all wandering creature from joining the hero). Right click on a square with wandering Bone Dragons (and adjacent squares) shows information. *** Ex. with Magic Well. *** Ex. with Artesian Spring. If the player can see an ennemy hero move onto the Artesian Spring, it's taken into account and right click on this Artesian Spring displays the info (already visited this week). *** Ex. with Daemon Cave. *** Ex. with Alchemist’s Tower (POL). *** Ex. with Tents and Barriers (POL). Change: If a Tent is already visited by a hero player, open directly the Barrier when a hero move into it, there is no need to have to remind password. As some of the suggestions changes the playstyle (ex: upgrading cost of creatures), they should be optional and editable in a xml file. *** Ex. with Lean-To, Skeleton (Desert), Wagon. Also, when an enemy hero has be seen on one visit map object that can give something (Ex: Lean-To, Skeleton (Desert), etc. ), the info is displayed (already visited). Also, when right click on an map object that can give Artifact (Ex: Skeleton (Desert), Graveyard, etc. ), the info is displayed (artifact: no free slot) (artifact: X free slots). Thanks, that should be helpful. I don't know if some of those things will be technically feasible, actually I am running into issues with just the changes I have already made, but I like the ideas. One thing that I could use help on is modifications to some of the graphics for widescreen. Right now, I have just hardcoded the 'widescreen' mode to add an additional 160 pixels to the screen (going from 640x480 to 800x480). I'm not sure what should be drawn in the extra 160 pixels (or 80 + 80 pixels on either side). Of course I'm open to suggestions or different versions if anyone else wants to come up with one. I'll maybe try mine for 800x480 when I will have time, but you have to be patient. Knight and Sorceress are good, Barb and Wizard are neutral, and Warlock and Necro are evil, correct? The 'adventure map' region in the unmodified version is 15x15 'tiles' wide/tall (each tile is 32 pixels, so the region is basically 480x480). 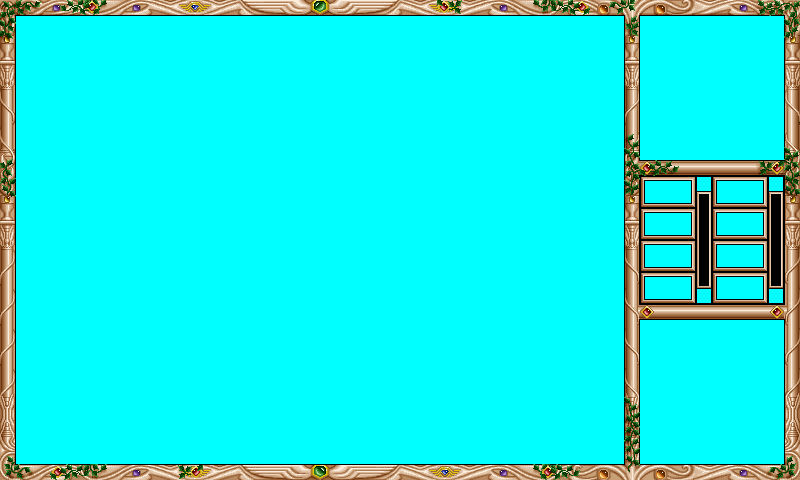 In the 800x480 version, I modified this region to be 20x15, so it will take up 640x480 pixels. Problem is, when centering the map horizontally, the width is now even, meaning there is no longer a 'middle' tile, but two middle tiles. I'm not sure what to do about this. My only concern is saving it as a .jpg, I didn't see any quality loss but I didn't look too closely. It would be better to make the different screens to be accessible, and make they work just like the other graphic files (.bmp graphics in .icn files), so they can be easily replaced or corrected if needed. There is no "neutral" castles/heroes in Heroes 2, there is "good" and "not so good" castles/heroes. Knight, Sorceress and Wizard are considered "Good", with the Good interface. Barbarian, Necromancer and Warlock are considered "Not so Good", with the Evil interface. Simple, just make the adventure map area 19x15 tiles (total screen 768x480 pixels, ratio 1.6), or 21x15 tiles (total screen 832x480 pixels, ratio 1.7333), or display 9 tiles and half a tile (16 pixels) each side of the hero (800x480 pixels, ratio 1.6666). In full screen mode (stretched screen), visually, the total screen 768x480 pixels (ratio 1.6) will be more pleasant and more close to the original screen size (total screen 640x480 pixels, 4/3 ratio 1.3333), the screen will be less "distorted and elongated" horizontally. And don't forget to remember the Dimension Door spell must be constrain in a 15x15 tiles area. Ok ok I return to dream more. An octagon for your "shape" would be better (in a similar way the fog of war is removed by the hero viewing area). 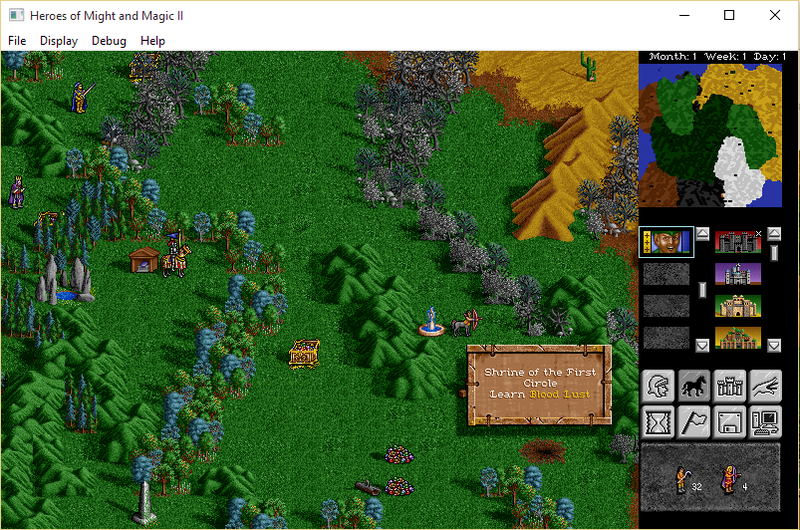 Actually, there is an "anomaly of functioning" due to the "hot spot" of the sprite cursor (the "active" pixel of the sprite cursor is located at the top left of the sprite cursor); the hero can "move" only 6 tiles to the right of the adventure screen area, and only 6 tiles to the bottom of the adventure screen area, unlike of 7 tiles to the left of the adventure screen area, and 7 tiles to the top of the adventure screen area when using the Dimension Door spell; so, the hero "moves" further when he goes to the north and to the west with the spell. Yeah, more or less "circle shape" is fine in my mind. interesting, but so isn't it a bug? The using "behavior" of the Dimension Door spell is, perhaps, not a "bug" from a programing point of view, whatsoever (quoique), but certainly a bug from an UI point of view. Hello! It has been a long time without any news in this post and I am very interested in these changes, how is it going? The widescreen changes are currently bottlenecked by efficiency -- it's not yet fast enough. We've done some work trying to ready the CD music changes. We have two new budding programmers, and I expect one of them to be up to the challenge at some point. I'd like to see an ability to switch between SW and PoL soundtracks (as well as Opera/Midi) in the menu. Yet, I suppose, it's not that critical for the release. This sounds like an interesting issue. This is what these forums are for. Yet, I am unable to lead a full scale promotion these days, but at least I try to keep the modding stream alive. Forums are no more a massive entertainment, social networks took that niche. Now it's more like a gathering place for the elite fans and a workbench in some cases, like freelance help from the community. Considering Ironfist, I'd also like to see more activity here from the team, but it's all centralized elsewhere.